Since 1973 Stuart Stamp & Engraving has been providing our customers with outstanding service and quality products. We manufacture marking and identification products such as stamps, seals/embossers, name badges and office signage. 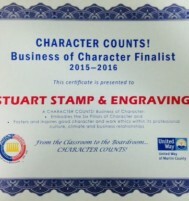 Stuart Stamp & Engraving also produces awards, personalized gifts and custom engraving.